We got our first CubbyKit recently, and spent a few days happily working our way through the activities. CubbyKit is a monthly subscription service. You pay to receive a themed box of craft activities each month, delivered to your door in a suitcase cardboard box, addressed to your child and it’s a source of great excitement when it arrives! This month we got a space themed kit. My five year old daughter Eve has begun to get a little interested in space and is already at the point of asking me questions that I don’t know the answer to. For reference, my two responses are either “Ask daddy” or “What do you think it is?” Failing that, I turn to my Usborne Children’s Book of Astronomy and Space (really, I have no prior knowledge at all) and look it up, before answering with some confidence. The CubbyKits are grouped into ages, and my daughter received the older age group, although Ben, who is a month off his third birthday, was involved in the whole experience too – in an over-enthusiastic and under-qualified kind of way! Our first job was to papier mâché the balloons to make models of the Earth, Sun and Moon. Apparently the Moon is a quarter of the size of the Earth. You see, I did not know that. Honestly, I’m a bit hopeless. I think my next OU course might have to be basic Astronomy, if they do such a thing. We left the models to dry for a couple of days hung out over my pan rack in the kitchen, before painting them. A couple of days later, we had a full day of CubbyKit activities. First was planet painting, which was messy and lots of fun. After we’d painted them, they went back on the pan rack to dry while we built the rocket. This was a nice, less messy activity that they could manage on their own while I tidied up a bit! After we’d done the rocket, we washed our hands and made some space buns – these were inspired by the CubbyKit website, an excellent resource with lots of ideas following the same theme as your CubbyKit. I would have attempted their Half Moon Cake but didn’t have enough of the ingredients, so we made vanilla fairycakes (I have the recipe for those embedded permanently in my brain!) topped with white icing and blue edible ‘space’ glitter. Lastly, we did the constellation chart. By this time, Ben had wandered off in the direction of his train set, which was ideal, as he couldn’t have managed this trickier activity. Eve found the gel pen a little difficult to manage but she got there in the end and enthusiastically glittered and stickered her chart. Everything has now made its way into her bedroom, together with some glow-in-the-dark stars. They had such a great time working through the activities and I love doing things with them that are really good fun, yet have educational elements worked into them, especially anything vaguely connected to science, which I don’t think is being taught much in Eve’s Reception class yet. Initially, I thought £20 a month was quite expensive for the CubbyKit subscription. Then, I sat and thought about it a bit more, and have changed my mind. As you may be aware, craft and I don’t get on terribly well sometimes, and so, with the best will in the world, I’d struggle to make things without some guidance. I’d spend as much money in craft shops trying to piece together something similar and probably do it wrong. With CubbyKit, everything is already there, weighed and measured out. Which means I have everything I need to do, and there is no wastage. Also, the instructions are really clear which is again really helpful. As a full time working mother, it’s hard to even get to a craft shop so the delivery of the CubbyKit means I don’t even have to do that. Finally, the other thing that is really valuable is the inspiration – so often, I’d like to do something with the kids but struggle to think of an activity. This removes that problem for me and the website with additional activities adds to that. In a nutshell, CubbyKit helps me be the craft-creating mum I have always wanted to be. The day after making all our space themed crafts, we all went to Eureka, the children’s museum in Halifax. In the gift shop, Eve chose glow-in-the-dark stars to add to her rocket and planets, and a rocket-themed maths board game, instead of her usual fairies/princesses/pink favourites. For me, that’s a real added bonus arising from our CubbyKit experiences. 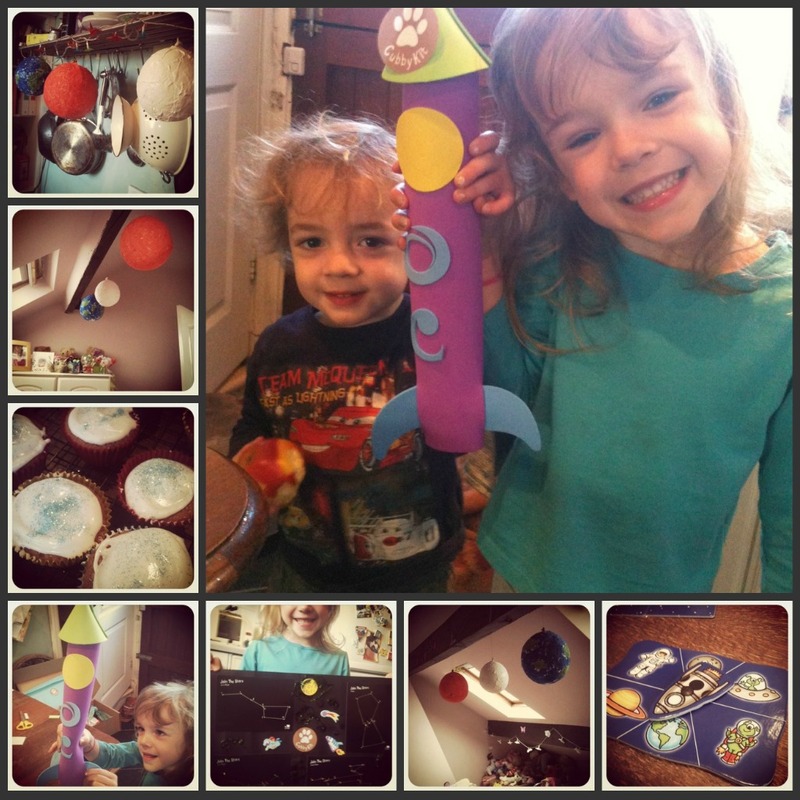 One Response to CubbyKit: Space Themed Crafts.